For the NZ tour Jasprit Bumrah was rested .. .. and India captain Virat Kohli will not play the last two ODIs of the New Zealand series, and the T20s that follow; he has been rested for those games, the BCCI said on Wednesday. Rohit Sharma will captain India in his absence. No replacement player has been named for Kohli. This will be the first time this decade India will be playing an ODI outside Asia (excluding Zimbabwe) without Kohli. Can you ever imagine, why play was held up at this stage for more than half an hour ? In Mar 2013 came the news that Trading members of the NSE may face connectivity problems at various times because of Sun Outage between March 5 and 18, - it was - a Sun Outage caused by an interruption in the geostationary satellite signals due to interference from solar radiation. It was stated by the Stock exchange that "Indian Space Research Organisation has informed us that there would be Sun Outage for INSAT-3A and INSAT-3E satellites affecting the VSAT connectivity from March 5, 2013 till March 18, 2013 due to which trading members may face connectivity problems at different times on different dates based on their geographical location during this period," the NSE said in a statement. A Sun outage, Sun transit, or Sun fade is an interruption in or distortion of geostationary satellite signals caused by interference (background noise) of the sun when it falls directly behind a satellite which an earth station is trying to receive data or transmit data to. It usually occurs briefly to such satellites twice per year and such earth stations install temporary or permanent guards to their receiving systems to prevent equipment damage. Sun outages occur before the March equinox (in February and March) and after the September equinox (in September and October) for the Northern Hemisphere, and occur after the March equinox and before the September equinox for the Southern Hemisphere. 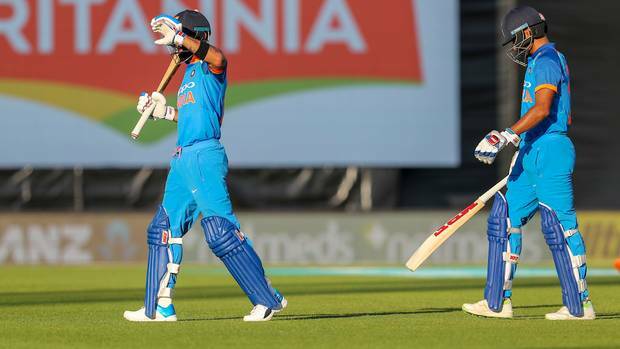 Mohammed Shami continued to challenge for India's first XI come World Cup with another lovely display of seam bowling to set up a comfortable win for India - their first in an ODI in New Zealand since 2009 - in the opening ODI of the five-match series. Back together for the first time since the Asia Cup final in September last year, the two wristspinners, Kuldeep Yadav and Yuzvendra Chahal, tied the hosts in knots. New Zealand's innings lasted only 38 overs and the target of 158 was never going to test India. India were missing two vital cogs, the best white-ball bowler in the world, Jasprit Bumrah, and Hardik Pandya, whose presence allows them to play the two wristspinners together. With Vijay Shankar in as Pandya's replacement - not in his league at the moment - India were finally happy to take the risk of playing both the wristspinners together. New Zealand went the other way tactically, picking the pace of Doug Bracewell over the wristspin of Ish Sodhi and the batting-first role of Colin de Grandhomme. In what reportedly looked to be a 300+ wicket, the Indian bowlers won the match. Kuldeep ran through the tail, with MS Dhoni calling the last wicket blow for blow. "He will defend eyes closed, you can go round the wicket and bowl the other one." 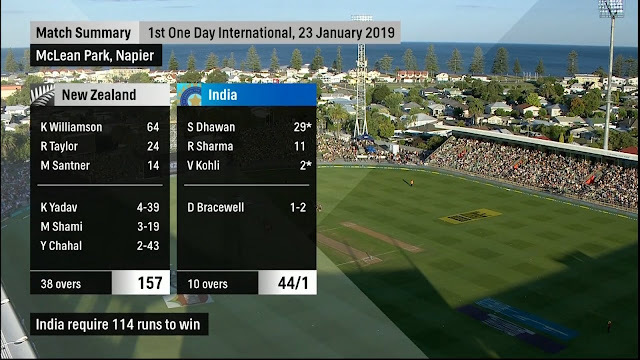 Kuldeep went round the wicket, Trent Boult tried the dourest front-foot defensive, and the ball didn't turn in, taking the outside edge for slip to gobble it. 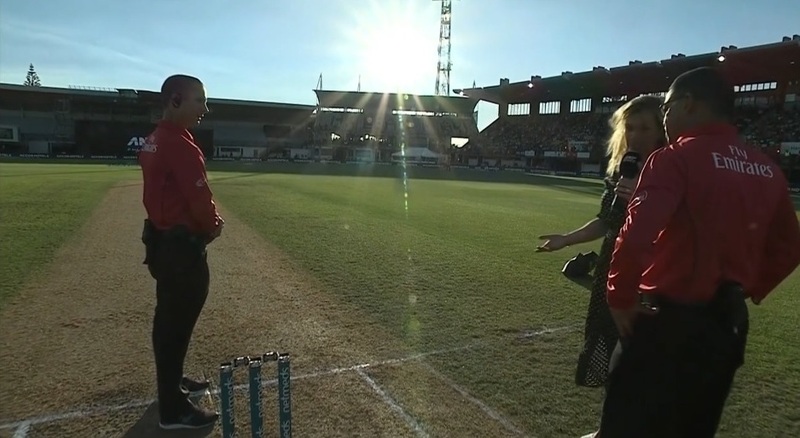 The only thing between Indian and victory was the setting sun, which was in the batsmen's eye, causing a delay of more than a half hour, and not for the first time at McLean Park where the pitches run from east to west. Post a delay of more than a half hour, India - already 10 overs into the chase - were asked to get 156 in 49 overs. As a final piece of good news, Shikhar Dhawan - averaging 20 over the last nine innings - signaled return to form with an unbeaten 75. McLean Park has a previous for it with the angle of the sun at around 7pm making it unsafe to play cricket. Two years ago, a T20I between Bangladesh and New Zealand was held up because of the same issue. On January 19 this year, a Super Smash match between Central Districts and Canterbury was also stopped for a while. The organisers were actually hoping for some cloud cover during the ODI between India and New Zealand. South African umpire Shaun George said he had never seen such an occurrence in his 14-year umpiring career. "The setting sun is in the eyes of the players and we need to think of the safety of the players as well as umpires," he said. He also said the move to go off was initiated by the umpires. "There was an awareness of it by the players but they didn't appeal." New Zealand captain Kane Williamson said at the press conference there was no other option but to wait in such a situation. "